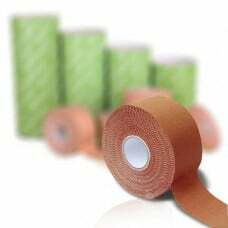 Sportz Strapping Tape is suitable for use by sportspeople and athletes to limit joint movement during high-stress sport activity. Strong adhesive and rigid construction help provide support to joints to help prevent injury during activity. Applying tape correctly will help minimise excessive joint movement that can cause injury. Suitable for taping fingers and hands. For sensitive skin or frequent taping, apply under-wrap first before taping. Do not use directly on skin if skin is sensitive to adhesive tape. Hand-tearable for faster and ease of application.